The Luton Hoo Walled Garden open exhibition comes but once a year and I was keen to enter again after having got three into it last year. Searching the Internet, I discovered that I could enter five this year. I was ahead of the game as I’d already painted “Another wall-flower”, but I still had four to do in a matter of weeks. My decision was to do them all concurrently so that as one became taxing I could drop onto another; and share a palette between several. “Back to nature “ was the first to be fully completed and so I include them here in order of completion. Part of the deal with the walled garden exhibition is that one submits sizes and names of work on entering. This means that one commits to these criteria quite early in the process. This doesn’t allow for names to evolve as the work is painted. So it’s a matter of picking names quite rapidly making sure you haven’t used the name before. I am really quite pleased with the title “Back to Nature” as I found more hidden meanings the longer that I thought about it. Firstly the foreground seat when used places one’s back to the plants in the picture. Then I thought maybe it was someone’s favourite seat who has subsequently passed on – “Back to Nature” as it were. So I was quite pleased with myself – though I doubt that the painting itself actually conveys any of this. The original photo was so nice and balanced with light copious fauna that I tried it in various canvas shapes and I believe it could have worked in all these formats. This format was chosen mainly for the benefit of other pictures that were less versatile. The photo is of a garden space in St. Albans that my wife took in July 2011. Once nearly finished I showed the picture to my mother for feedback. Well disappointingly she didn’t like this much at all. She didn’t like the chair being cut off by the edge of the canvas and other bits and pieces. My wife and I liked this composition and I wasn’t about to give up on it. 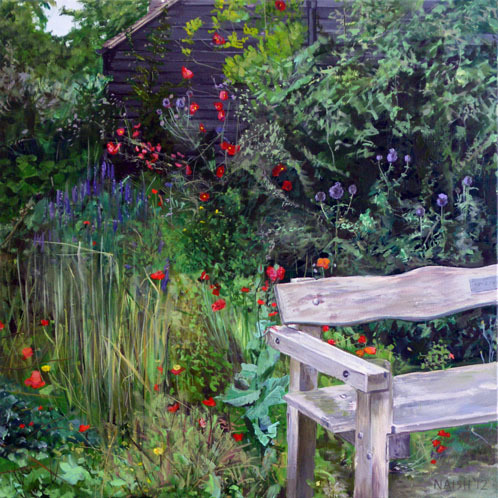 I did draw on the criticism however and added more detail and lightened foliage immediately behind the chair. I found the consequences of this alteration quite interesting. Often “improvements” just tighten up what is already there and clean up rough aspects. In this instance, however, the picture changed from being a selection of details (which I liked) to being a more linked image with a bit more depth (which I also liked) – Mother is yet to be convinced.